This spicy and super-charged Lemon Honey Ginger Turmeric Tea can help you to stop a cold in its tracks and to speed up your recovery. This is my go-to recipe when I feel a cold coming on. It uses ingredients like honey, cinnamon and ginger that have been used for centuries to cure the common cold. The best part is that you are likely to find most of the ingredients in your own kitchen cabinets. Common spices like ginger, pepper, cinnamon and turmeric have a warming effect on the body. They are literally able to knock out a cold. They warm your body which is just what you need when your body is all achy and struggling to keep warm while fighting the germs invading your body. Both ginger and turmeric have potent antioxidant, antiviral, antibacterial, antifungal, and anti-inflammatory properties. They help help protect your body from free radical damage and provide immune system support. 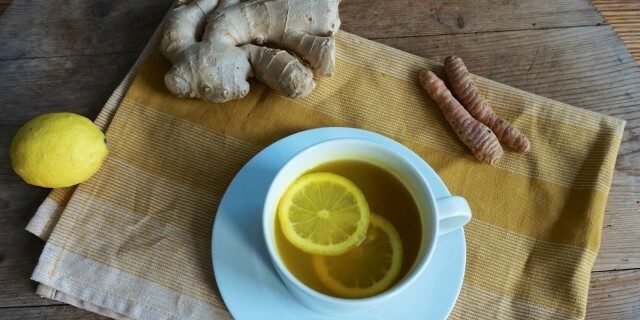 Ginger is also a natural pain-killer and when combined with honey, a mild antiseptic, it can soothe a sore throat. Cinnamon is another powerful spice which can help cure a cold naturally and quickly. It also has strong antibacterial, antiviral, and antifungal properties. Black pepper may be a very common spice which you can find in any household but it boasts impressive antioxidant and antibacterial effects. Due to its antibacterial properties, black pepper is a very effective natural remedy to relieve the symptoms of a cold. It helps loosen phlegm and relieve a stuffy nose, so you are able to breathe easier. I like to use both fresh and ground ginger and turmeric but you can also use the spices in either the dried or fresh form, whatever’s available. I like to add powder too, because the Lemon Honey Ginger Turmeric Tea becomes more pungent, which feels really good when I am feeling run down. If you don’t like it too spicy, use fresh ginger and turmeric instead. Bring water up to a boil in a small pan. When the water is boiling, add the lemon slices, ginger, pepper corns, cinnamon and turmeric. Lower heat and allow to simmer for 10-15 minutes. Serve in a tea mug with your desired amount of honey. I like to add in a whole tablespoon.